This was one of my lunches this week. The protein source I opted for on this occasion was salmon for a source of Omega 3s (or ‘healthy fats’ as some people may know it by), which is an essential fatty acid the body can’t produce itself, so must be consumed through foods. As Omega 3s are known to fight disease and promote healthy joints, it’s not a bad choice. The accompanying salad was a mix of my favourite greens and a sweeter addition in semi dried tomatoes, topped with pine nuts, which were all a good fibre source. Salmon is one of my favourite meals, but everyone has their own food preferences. Eat to suit your needs and preferences and remember to try to keep consuming a variety of foods to meet your macronutrient and micronutrient needs! Mix salad into a bowl. Season the salmon skin with salt. Heat 1 table spoon olive oil in a medium non stick frying pan over medium high heat. Place the salmon in the pan, skin side down, and cook for 3-4 minutes or until the skin is golden and crispy. Turn the salmon and cook for a further 2 minutes or until your liking. 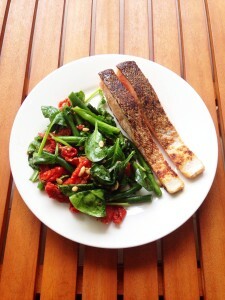 To serve, arrange the salad on a serving plate and add the salmon. Healthy eating doesn’t have to mean you avoid the foods you love, nor does it have to mean hours and hours of food prep. Check out this recipe below for a simple and easy to prepare Thai dish (who doesn’t like Thai food?) which contains a great mix of macronutrients, and most importantly is delicious! Step 1: Heat half the oil in a wok over high heat until just smoking. Add the almonds and stir-fry for 1 minute or until golden. Transfer to a heatproof bowl. Step 2: Add half the chicken to the wok and stir-fry for 2 minutes or until brown. Transfer the chicken to the bowl with the almonds. Repeat with the remaining chicken, reheating wok between batches. Step 3: Heat the remaining oil in the wok. Add the onion, broccolini, chilli and garlic and stir-fry for 2 minutes or until the broccolini is bright green and tender crisp. 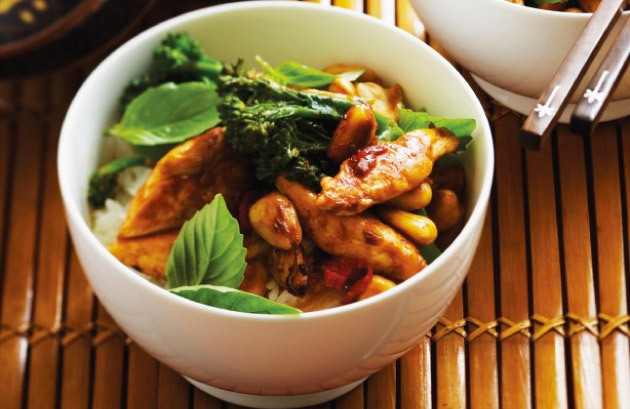 Add almonds, chicken, shallot and chilli jam and stir-fry for 2 minutes or until heated through. Step 4: Spoon the stir-fry among serving bowls. Sprinkle with basil and serve with steamed rice.